Although Bernie’s run stopped short of the nomination, his delegates are continuing to push for his politics across the country. When Tom Gallagher was a Massachusetts delegate for Senator George McGovern in 1984, Democratic National Conventions were a bit different. “This was before it was just one big infomercial,” Gallagher, now 67 and living in San Francisco, said. At the convention in 1984, McGovern had only 23 delegates to his name, and Gallagher was one of four who refused to switch his vote to former vice president Walter Mondale, the Democratic Party’s presidential nominee, despite McGovern’s urging his delegates to do so. Similar to 1984, this time around California once again did not go to the insurgent candidate. And as a delegate for Bernie Sanders, Gallagher knew what was in store long before he arrived in Philadelphia in July. “There wasn’t anything left to push for on the convention floor—a lot of people walked into this not realizing that this was the game,” said Gallagher, a substitute teacher and former member of the Massachusetts House of Representatives. And so, the stage was set for the first Democratic convention in US history where a politician running on a democratic-socialist platform received 43 percent of the primary vote. As if the impending, and slightly preemptive, celebration of Hillary Clinton wasn’t enough to rattle Sanders delegates, the toxic triumvirate of the selection of Tim Kaine as Clinton’s vice-presidential nominee, the Democratic National Committee e-mail leak, and the timing of the Democratic convention on the heels of a particularly discordant Republican convention sealed the deal. Of the nearly 20 first-time Sanders delegates interviewed for this article—each of whom identifies as a socialist of one stripe or another—almost all either experienced or witnessed Sanders delegates being harassed in some way, and many felt excluded and unwanted. These incidents ranged from Democratic Party officials’ removing signs that weren’t approved and DNC operatives’ taking Sanders’s delegates seats, to bitter exchanges with Clinton delegates and even physical intimidation. 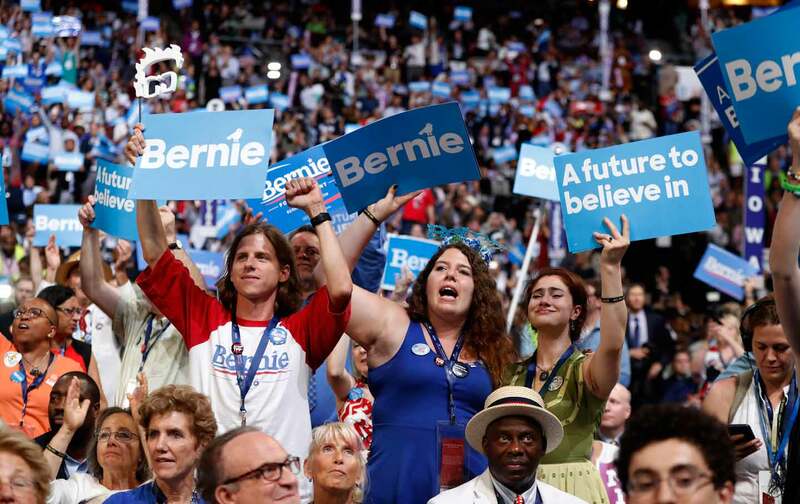 While the overall experience of the DNC was not entirely pleasant or uplifting for this group of delegates, they all emerged from the convention with a renewed commitment to continuing Sanders’s political revolution, albeit in different ways. Many plan on working toward change within the Democratic Party, while others are looking to the Green Party or independent politics for a new home. Like many of Sanders’s foot soldiers, Amanda McIllmurray started volunteering long before campaign staffers opened up offices in Philadelphia, Pennsylvania. McIllmurray, 23, had already been volunteering for almost a year when she helped the campaign set up shop near her South Philadelphia neighborhood in late March. Soon after, she was hired as a full-time field organizer and quit her day job as an office manager at a local law office. Soon after the Pennsylvania primaries, McIllmurray, along with a group of former Sanders staffers and volunteers, created Reclaim Philadelphia, an organization working to build a progressive majority through issue-based and electoral campaigns, as well as policy research and direct action. Leading up to the Democratic convention, the group organized a series of demonstrations to call attention to the convention’s corporate donors and to demand that the host committee release its fundraising data. McIllmurray isn’t one to shy away from protest—the week before the convention she was one of six activists arrested during a sit-in organized by Reclaim Philadelphia at the DNC headquarters. In addition to being a delegate, she was also a whip for the Pennsylvania delegation, and was responsible for passing along requests from the Sanders campaign that delegates not express their dissent on the floor of the Wells Fargo Center. While McIllmurray conveyed Sanders’s messages to the delegates, she also didn’t discourage them from making their voices heard. “I told them to do what felt right, regardless. I thought it was important to bring these issues to the floor. If we didn’t bring these up, who would?” McIllmurray said. Coming out of the convention, she is deeply distrustful of the political system, and thinks issue-based campaigns are at the crux of holding politicians accountable. Beyond the elections in November, one of her main goals is to see the left build power by challenging structural issues such as fighting the TPP and advocating for police reform. On the ground in Philadelphia, she’ll be carrying out this work with Reclaim Philadelphia and her local chapter of the Democratic Socialists of America. Waleed Shahid’s first foray into activism was attending Iraq War protests when he was a teenager. Now 25, he was a delegate for Pennsylvania but recently moved to Brooklyn, New York. In the lead up to the elections this fall, he is worried that Sanders delegates will feel like the Democratic Party is no longer the place for them. Sahid noted that Sanders’s volunteers and supporters made a significant impact, and that continuing their participation is key. “Just because they lost doesn’t mean they can’t win again,” Shahid said. One possible antidote to political apathy could be the WFP’s plan to launch new chapters that members can organize on their own. Though this initiative was already in the works, WFP has seen an uptick in the number of people who are contacting the organization about getting involved. “You’re going to see social movement leaders moving from grievance to governance,” Shahid said. Moumita Ahmed, of Queens, New York, is the national grassroots coordinator for People for Bernie and the lead organizer for one of the organization’s constituent groups, Millennials for Bernie, which was recently renamed Millennials for Revolution. Ahmed first learned the value of local political campaigns through working for a progressive candidate in Nassau County. She then went on to volunteer with Zephyr Teachout’s campaign for governor. As an at-large delegate from New York, Ahmed, 26, spent some of her time on the convention floor getting to know Clinton delegates. Many Clinton delegates didn’t understand why, in light of Sanders’s endorsement of Hillary Clinton, his supporters were demonstrating during the DNC. “They really thought we were going to go there and sit down and watch the show and go home,” Ahmed said. After more than a year volunteering for Sanders and working nonstop for People for Bernie, Ahmed was feeling burnt out after the DNC, and took the closest thing to a vacation that an indefatigable organizer like her could muster—spending a little over a week in Colorado collecting petition signatures for a referendum to ban fracking. Ahmed added that focusing on anti-fracking work—an issue that was also at the center of Teachout’s campaign—is imperative, since a ban on fracking didn’t make it into the Democratic Party’s platform. Once she returns to New York, she plans on harnessing the power of Millennials for Revolution to help support local politicians throughout the country that embody Sanders’s values. The group is also undertaking a 100 Days of Action campaign to push the next president to implement Sanders’s platform, starting on January 20, 2017. In the midst of the housing bubble burst a decade ago, Joey Aszterbaum was working as a home-loan consultant in California. For most of his career in the real-estate industry he was also a Republican. Though he says he considered himself one of the “good guys,” by 2009 Aszterbaum could no longer fight the nagging feeling that he was somehow complicit in the widening divide between the poor and the rich. So he quit his job, started helping out with his wife’s photography business and made it his goal to live below the poverty line so his taxes wouldn’t go toward the wars in Afghanistan and Iraq. He also went back to school to become a pastor. Aszterbaum, now 41 and employed as a social-services worker in the small town of Hemet, California, watched from afar as Occupy Wall Street and the Black Lives Matter movement took root. Soon after Sanders announced that he was running, Aszterbaum watched one of his speeches on TV, and immediately related to the candidate. “I do my job because I care about people, and here’s a guy running for the highest level of government doing the same thing,” Aszterbaum said. As a pledged Sanders delegate, he arrived at the convention with a fresh haircut and his best suits. But when Sanders delegates shouted down California Secretary of State Alex Padilla at the delegation breakfast Monday morning, Aszterbaum’s hopes of having congenial conversations with other delegates were dampened. “I thought I was going there to be a diplomat, but I ended up being an activist instead,” Aszterbaum said. He spent the rest of the convention attempting to participate in what he thought would be a democratic process by trying to flip Clinton delegates and taking part in the walkout after Clinton was announced as the presidential nominee on Tuesday night. However, now back on the West Coast, Aszterbaum is planning to get involved with Brand New Congress and Our Revolution and is volunteering as a campaign manager on a local City Council campaign. He’s also stubbornly continuing to work with his local Democratic club and is considering a future run for political office. “I’m hoping people will commit to staying in the Democratic party to change things because I think we’re on the cusp of starting to create real change,” Aszterbaum said. Khalid Kamau, a “30-something” Sanders delegate from the south side of Atlanta, Georgia, might also participate in Brand New Congress’s call to recruit and run more than 400 congressional candidates. Kamau, who is currently directing field operations for a house race, is considering throwing his hat in the ring after the current congressman in his district, David Scott, endorsed a Republican senator who is an outspoken opponent of the Affordable Care Act and Medicaid expansion. Zuñiga, who is a father of two and works in the sales department at Costco, is heeding his own advice and running for City Council as a Green Party candidate. Prior to the DNC he was a registered Democrat, but after coming home from the convention—which he described as “the most patriotic and disenfranchising experience of my life”—he immediately switched his registration to the Green Party. While Amber Thomas of Norman, Oklahoma, doesn’t plan on running for elected office anytime soon, she also changed her party affiliation to Independent after her stint as a delegate at the DNC. Thomas, 42, had been a registered Democrat her entire life, but at heart is a democratic socialist. During Sanders’s campaign, she volunteered as a canvassing-team leader and registered voters in black neighborhoods north of Oklahoma City where some of her family members and friends live. “I’m African American, and so they felt comfortable with me,” Thomas said, adding that when they heard she was supporting Sanders, “they were surprised, but most people were open to listening to what I had to say.” Thomas’s background is also Cherokee, Irish, and German. Though she doesn’t plan on supporting any of the presidential nominees, she will be voting down-ballot for local progressive candidates. Thomas is going to continue volunteering on local campaigns, with the goal of getting as many progressives and “Berniecrats” as possible in office, particularly at the state level. “We can’t throw in the towel and give up,” Thomas said. Hannah Zimmerman, of Brooklyn, New York, is a senior studying composition and operatic voice at Fiorello H. LaGuardia High School of Music & Art and Performing Arts. Since the summer of 2015 Zimmerman added volunteering with the campaign to her already-crowded schedule of five AP classes and three hours of music classes each day. She initially focused her volunteer efforts on Team Bernie NY, but when the group kept sending other teens her way, she founded High Schoolers for Bernie, which formed chapters in 45 schools throughout the country, expanding from New York and New Jersey to states like California and Arkansas. At 16, Zimmerman was too young to be a delegate, so she was appointed to the credentials committee. Still, technically, she was the youngest member of the national delegation. Zimmerman, who recently turned 17, said that at the DNC, Clinton delegates failed to recognize that Sanders’s delegates and supporters needed time to process the emotional loss of not receiving the presidential nomination. “They expected us to have already gone through the five stages of grief and to be ready to endorse Hillary. But we had just started the mourning process for Bernie,” Zimmerman said. She now has set her sights on what’s next for High Schoolers for Bernie, as well as finding the best way to work on the myriad issues that Sanders’s campaign raised. She also recently joined the Young Democratic Socialists (YDS), and this fall High Schoolers for Bernie groups will have the option of re-chartering as YDS chapters. At their conference last month, Zimmerman was elected to the national coordinating committee of YDS. Elizabeth HendersonElizabeth Henderson is a freelance journalist based in Boston. She has previously written for Dissent, City Limits, Waging Nonviolence and The Indypendent. You can follow her at @lizthenderson.